It is becoming increasingly impossible to ignore: time flies, and where do all these year go? 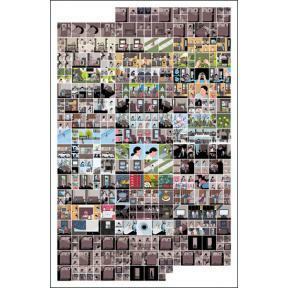 But just in time, we are immensely proud to present our latest installment of mono.editionen, in the form of one giant poster, by none other than Chris Ware. Because it is precisely those questions – the passing of time, children growing, parents getting older, those inescapable and terrifying undercurrents of daily life – that no one can handle more gracefully than Chris Ware, capturing the larger and smaller issues of life in his inimitable tiny squares of hand drawn precision and beauty. This story, without a title and in fact entirely without words, was first published as part of Chris Ware’s masterpiece 'Building Stories'. We can literally feel days and months and years flying by, with past and present and future all merging into one, the relentless tide of time broken up only by memories of small moments that are as mundane as they are heartbreaking. For this limited edition, the story is rearranged to an oversized poster (98 x 64 cm), undermining the flow of the storyline but emphasizing the synchrony of memory. Needless to say, it is utterly beautiful and available only here and now, from us, for you. Please note: All posters are sent in tubes and unfolded. Postage for items is calculated per item and in addition to any other orders. If you order several posters at a time, they will be sent in one package, and we will refund the extra shipping costs.